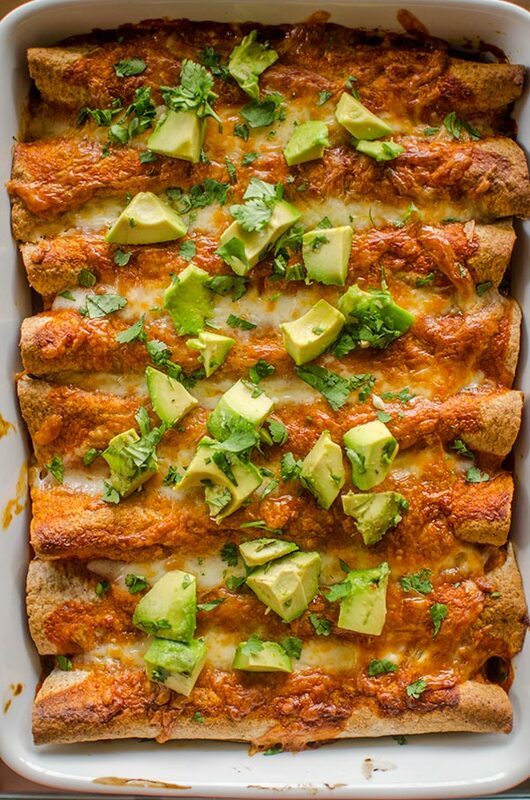 Chicken and black bean enchiladas with red sauce are perfect for a Mexican-inspired dinner topped with avocado, cilantro and cheese. Enchiladas weren’t something that I grew up eating. Tacos, yes, but enchiladas weren’t really something I was familiar with until a couple of years ago. The first time I had them was at a small little Mexican restaurant in Toronto (that has since closed), but from the first bite, I was sold. Then I went on the hunt for enchilada sauce, which was surprisingly hard to find at the time. I’ve since discovered that it was just the grocery stores in the area that I used to live, enchilada sauce is actually pretty common and easy to find in Toronto (duh, we have practically everything here). You could also make your own red enchilada sauce, but sometimes, it’s just easier to buy. You know? For this recipe, I knew that chicken was the way to go, but I didn’t want it to be too heavy on the meat so I added in black beans. It’s the perfect, budget-friendly way to stretch this meal–it only uses two chicken breasts and then a can of black beans. Enchiladas are a little more labour intensive than tacos, but just slightly. The first step is making the filing, then the tortillas are stuffed with the filling, slathered with enchilada sauce and cheese and baked in the oven until everything is all bubbly, gooey and melted. I like to top mine with avocado and cilantro, but if you’re not a fan of cilantro you can definitely leave it off. Personally, I love the flavour. This chicken and black bean enchilada recipe makes quite a large serving, I’ve never tried freezing it, but I would recommend freezing the mixture (before adding the beans), but not the tortillas and cheese. You can assemble it once it the filling has been thawed. 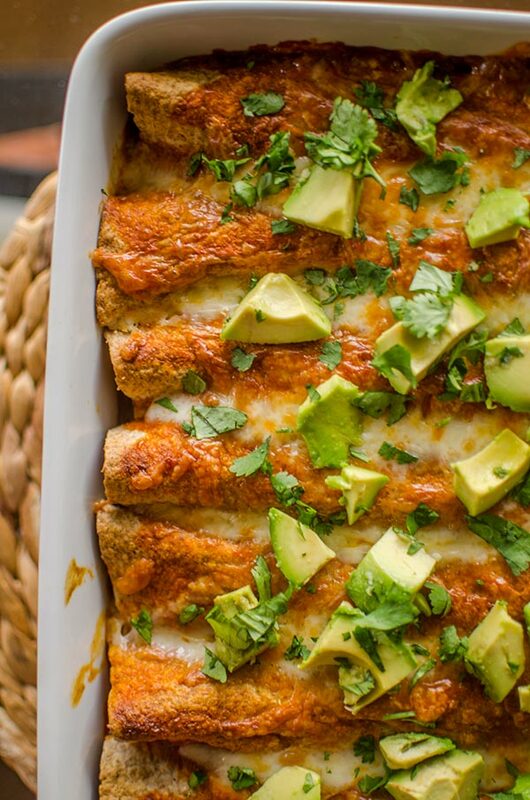 Pro-Tip: These enchiladas go really well with sour cream. Heat a large saute pan over medium heat, add canola oil and onion. Cook for 3 minutes until slightly softened. Add garlic, chipotle, cumin and salt, cook another minute until very fragrant. Add chicken, cook 5 minutes until not pink remains and chicken is almost fully cooked. Stir in salsa and black beans. Remove from heat and set aside. Pour half the enchilada sauce on the bottom of a 9x13" oven-safe baking dish. Divide chicken evenly mixture between 8 tortillas, tightly wrap and place seam-side down in the baking dish. Top with remaining sauce, sprinkle with cheese and cook until cheese is bubbly and melted, about 15-20 minutes. Top with avocado and sprinkle with cilantro. 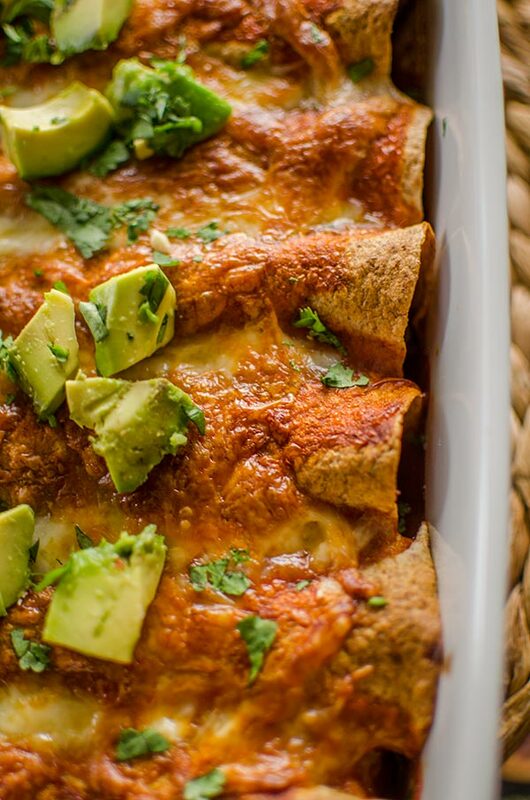 Let me know if you give these chicken and black bean enchiladas a try in the comments below. I'm on a black bean, cilantro and avocado kick right now! These should satisfy my craving and not leave me hungry! Yum! It's a favourite combination for sure, I hope you enjoyed!